The Zero Waste Zone ~ Downtown Atlanta is now official!! The ZWZ was announced to the media on Tuesday, February 10 via a press conference at the Georgia World Congress Center. Stan Meiburg, Acting Regional Administrator, U.S. Environmental Protection Agency (EPA) Region 4, led the press conference with an overview of the importance of the ZWZ. Lynnette Young, Executive Director of Sustainable Atlanta, Laura Turner Seydel, ZWZ Honorary Chairperson, and Kevin Duvall, Assistant General Manager GWCC, each gave particulars on the impact of the ZWZ to Atlanta, the southeast and the nation. Media response has been excellent on all mediums ~ click here for a list of media coverage links. The Meeting Planners International conference finale luncheon was held at the GWCC following the press conference. Huge Announcement: All food related to the luncheon was consumed, donated to the Atlanta Community Food Bank or hauled for composting. NO FOOD RESIDUALS WENT TO THE LANDFILL!! 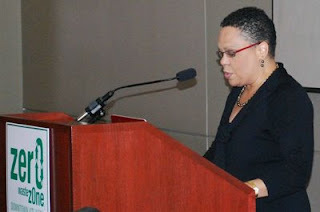 For more details on the MPI luncheon, visit the GFA blog. This is only the beginning. Stay tuned as we continue divert more and more tonnage of product from going to landfills! Did you know the City of Atlanta lost a convention to the City of Orlando last year because the client perceived Orlando as a greener city? Atlanta is a convention-driven city and I decided to make this decision my first best friend. Now when speaking to Atlanta foodservice operators I could explain going green goes beyond ROI (return on investment) to the Big R (revenue). When I learned Meeting Planners International's February national convention would be held in Atlanta, I knew I was given a second best friend. MPI members are the decision makers for future conventions, conferences and corporate meetings. The February conference is an opportunity to educate these decision makers that Atlanta is Pioneer City in Sustainability. 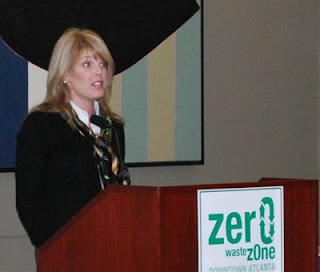 The Zero Waste Zone ~ Downtown Atlanta was formed in partnership with Atlanta Recycles and comprises the downtown Atlanta convention district entertainment venues, convention facilities, hotels and restaurants. Parameters of participation include recycling common recyclables, using spent grease for the local production of biofuel and composting food residuals. A press conference is scheduled on Tuesday, February 10 to announce the ZWZ ~ Downtown Atlanta to the media. To the best of our knowledge, the ZWZ is the first concentrated effort in a major city to change the landscape from waste disposal to product generation. Stay tuned for exciting updates and the difference we are making in Atlanta.